Most of the time when we are traveling, we start looking for breweries to eat at. I love beer, we both love good food, and breweries usually offer both of those. We actually started our night at Purple Sage for a “Welcome to Town” reception thrown by the couple whose wedding we were in town for. A lot more people than they were expecting to show up showed up, so the small upstairs room where the reception was being held filled up quickly. We were able to get a couple of drinks and some appetizers before things go too crazy, but once the room filled up, it got pretty warm. We hadn’t eaten dinner yet and we had thought about just going downstairs and getting a table in the actual restaurant, but the menu was a little too fancy for us. Instead, we decided to walk up the hill a few blocks and find a brew pub. 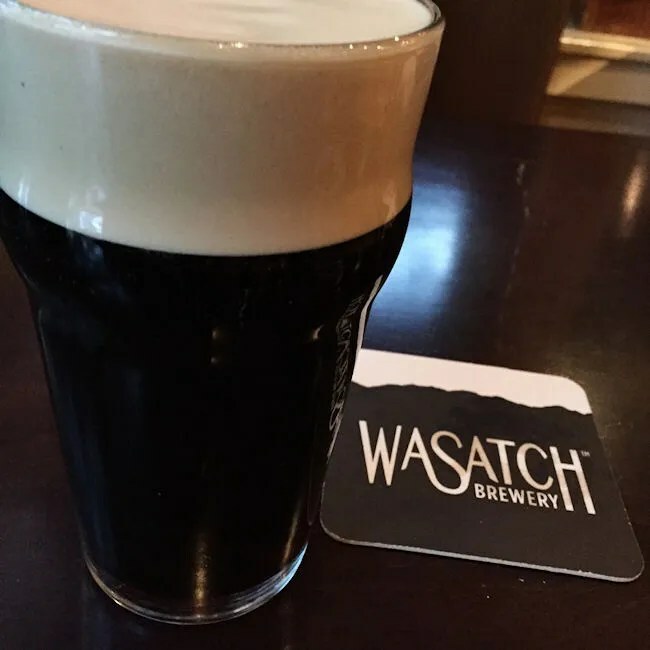 Wasatch Brewery is Utah’s oldest brewery. They started brewing in 1986. That’s really impressive when you consider Utah’s strict liquor laws. Somehow, they were able to survive and thrive in an anti-alcohol climate just outside of Salt Lake City. 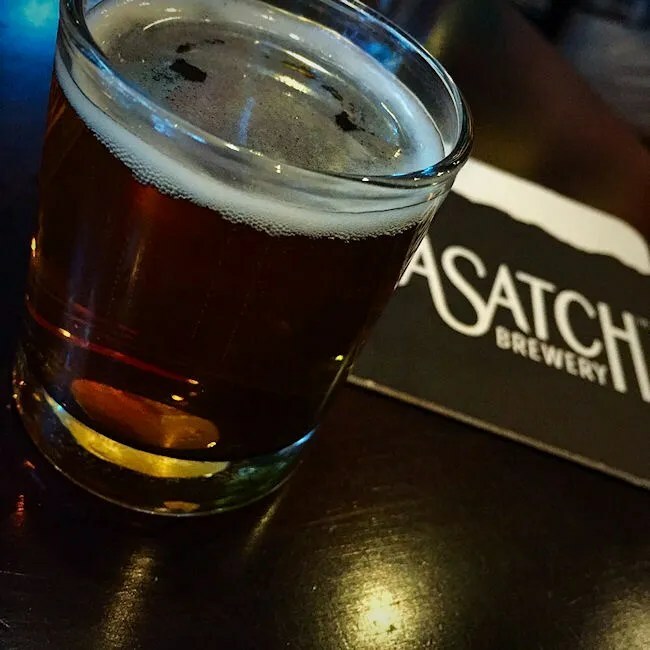 Wasatch is pretty much single-handedly responsible for breweries and brew pubs being legal in the Industry State. 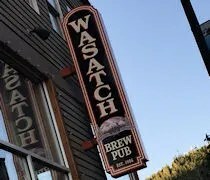 Wasatch has two brew pubs in the area. 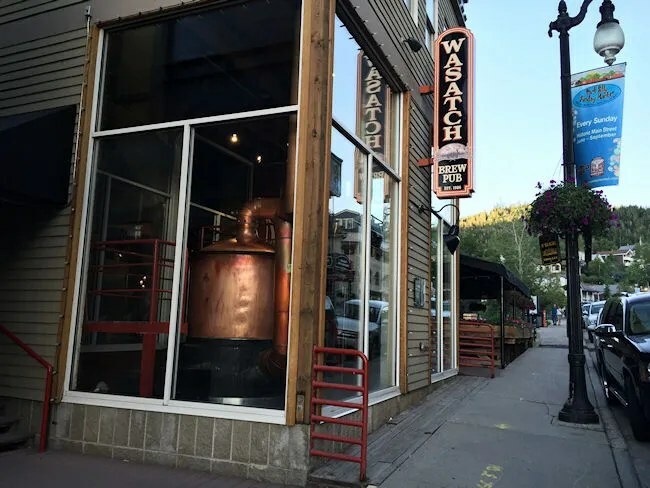 One of them is in the Sugar Hill Neighborhood of Salt Lake City while the original brew pub is on Main Street in downtown Park City. We walked in to the Park City brew pub right around 8:00 on a Friday night. We noticed some people waiting outside, but it turns out they were just waiting for a seat on the patio. While the heat can be oppressive during the day in the area, at night, things cool down quite dramatically and outdoor dining as the sun goes down is preferable to most people. We weren’t married to the idea of sitting outside. Most importantly, we wanted a table quickly, so we elected to sit inside. The brew pub has a huge dining room inside as well as a large bar. We were taken to a booth near the back of the space by the host who left us with the beer menu so I could start prepping my course of action in tackling yet another Utah brewery and their weird laws. Turns out, I wasn’t really into drinking a whole lot that night, so I kept it simple. They didn’t have anything really hoppy available, so I just ordered a pint and one taster. The pint that I ordered was the Polygamy Porter on Nitro. I was told later this is one their signature and most popular beers. It’s a very smooth porter with a little bit of a chocolaty taste to it. It was served with a really foamy head from the Nitro. The taster I ordered was the Jalapeno Cream Ale. This pepper ale had a really strong pepper smell, but the taste of the pepper was subdued nicely by the cream ale. I actually really liked this one, but not sure I would have wanted a whole pint with dinner. It’s a nice sipping pepper ale. For the first time on this trip, I actually had a burger….a trend that would continue right up until the time we left six days later. My selection was The Wasatch. 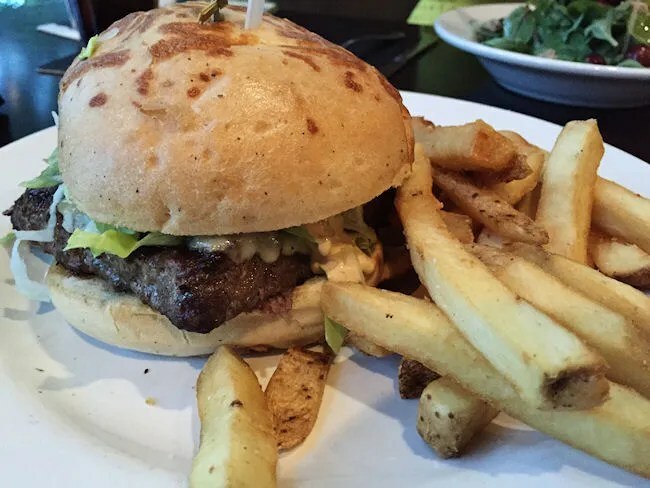 The burger is a house-spiced buffalo burger with a cajun remoulade, lettuce, and local spiced Beehive cheddar. It was served on an onion roll with skin-on fries served on the side. The burger was very tender and cooked to a perfect medium with a pink center. The fries were nice and crispy and a delicious compliment to a very tasty burger. J decided to go a different route with dinner and ordered the Pub Salad. 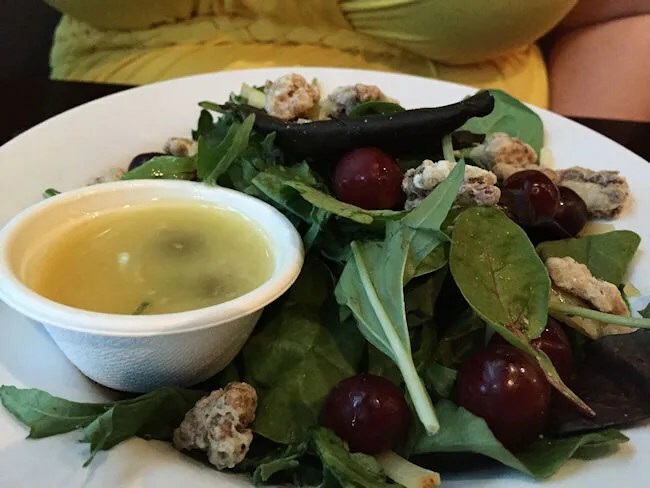 The plate came with organic greens, red onions, candied walnuts, Beehive cheddar, and grapes. The dressing is a honey-wheat balsamic vinaigrette. She actually left the red onions off the plate though and without them, she was left with a delicious salad. We knew that there was going to be a lot of good eating over the next several days and this salad is a perfect lighter option. Our bill, with tip, was just a little over $40. I didn’t get to try as many beers as I would have liked to, but honestly, the whole 2 oz. taster thing can get exhausting. I did end up having one of their other big beers, The Devastator, the next night at the wedding, so I got my hands on a couple of Wasatch’s signature beers.